I am working through my Shame List this week, the list of stuff that really needed to get done that always got pushed back or overlooked on my to-do list because, you know, career, etc. First on the list: get a new debit card. Because I went grocery shopping last May, and when I swiped my card it was declined, and I had that moment of irrational panic, like maybe we actually had no money at all, but then the cashier told me the card came up expired, and I was all, ‘oh, no, that can’t be’, but it was, and I was wrong. So I put it on the list, calling the bank to get a new one. And I ended up charging my groceries, on a credit card, which felt all kinds of wrong, and this is how the economy tanks. That list, that list from last May? Was still sitting in my to-do notebook, all of its items unchecked, in November. Shame! And what is worse is, I didn’t have access to our bank accounts, for over 6 months. Yet I am the one who does the money in this household. It just does not get stupider than that, but the longer I waited, the more shame was heaping up on my to-do list, and then I decided to pretend like I am some bohemian free spirit who doesn’t need money (but does need an American Express card), and that got me through August, but at some point you have to bite the bullet, and so I did. Luckily, the woman at my bank was so nice, as I told her my shame. She asked me what happened to the replacement card they had mailed me, and instead of making up some lame excuse, I told her the truth: that I vaguely remembered them sending me one, well in advance, and how I put it someplace very safe, so safe that now I have no idea where it is. Then I told her how I didn’t call for 6 months because the longer I waited, the stupider I felt, and that angel at the bank FedExed me a new card the next day, and told me how refreshing it was to have someone not lie to her about what happened and what they need, and we both laughed at how safe that first replacement card must be. New bank card: off the shame list. Sadly, what didn’t get off the shame list in time was, ‘pack up the backyard before it snows’. 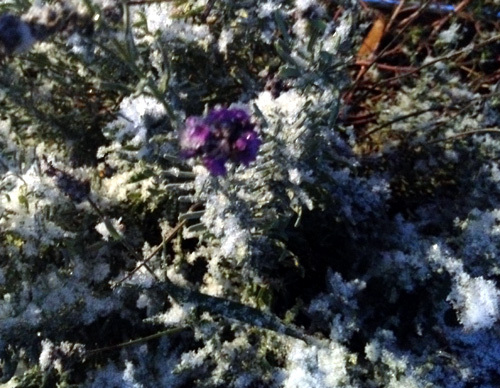 It snowed yesterday – first snow! – and it snowed all over my patio furniture, patio umbrella, and grill, which I have been meaning to put away for the past month. I blame Obama, really. 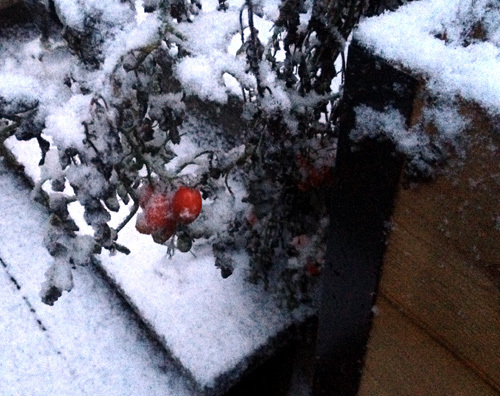 Snow tomatoes! We had such a weird growing season that in October, my raised bed suddenly sprouted a late set of lettuce, tomatoes, and peppers. All of which are now under snow. As is my lavender! The kids were home for Veteran’s Day, and in the basement all day watching movies and reading books, so they didn’t realize how much snow was falling until they came upstairs to help with dinner, and at that point, I realized that old-me would have made them stay inside so that I could get dinner on the table on time, and new-me wanted to play in the snow, so out we went! 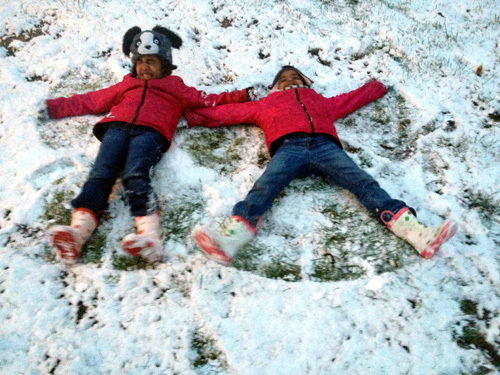 It didn’t quite cover the grass, but we had fun, making angels and playing snow-soccer as it got darker and darker out. I kept having to restrain myself from curtailing the fun. In my old life, fun never got to happen spontaneously, because nothing happened spontaneously. Every block of time in every day was rigidly accounted for, and I was always behind, behind, behind, and running to catch up. But last night, I just stood on the patio with my husband, arm-in-arm, watching our kids play, watching them get soaked, watching them revel in the excitement of playing outside in the dark, and I tried to focus on just relaxing, just being in the moment. It is a process, I think. A muscle well-atrophied, that I want to rehabilitate, little moment by little moment. Tonight I put my kids to bed, a job my husband had taken over so that I could eke more work time out of the day, and we snuggled and read Bedknobs and Broomsticks, and then their eyes got big and their eyelids heavy and as they drifted off, one of my girls said to me, “Mommy, I missed you,” and then she fell asleep. The Shame List is bigger than I thought.